Dear Readers, we have already published figures of Circle wise winning Operators in GSM subscriber base as of May 2014 in the form of a MAP earlier. Seeing the tremendous response and feedback from you Readers we have made the same for Rural Subscriber base taking the reference of COAI data in as is form. It can be observed that there is no considerable difference in shift in change of Operators Circle wise from our previous statistical Map to the Rural subscriber base statistics. Dear Readers what is your opinion regarding the performance of operators in rural areas? Do let us know via comments. Note: Manual work involved. May or may not contain error in fetching/posting statistics. Let me know incase of any errors via comments. 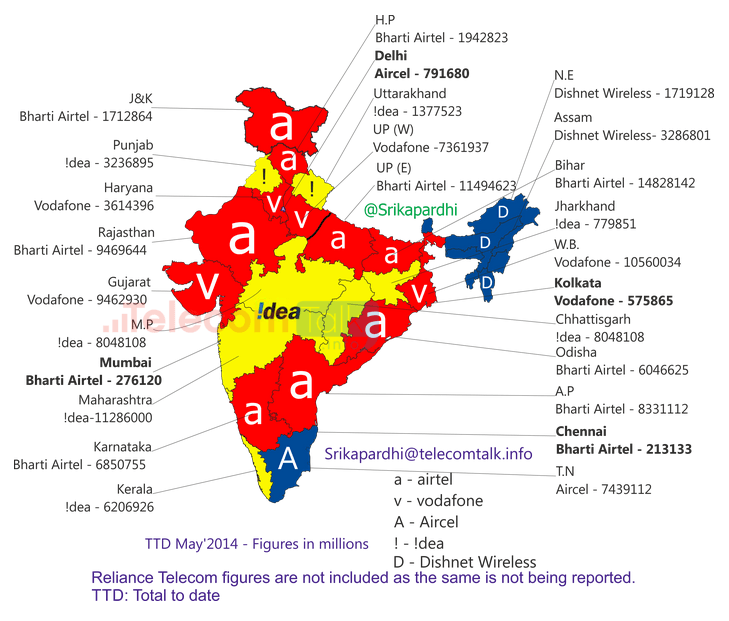 The figures are taken as per COAI – Rural Subscriber Figures May 2014. For some circles only a few operator figures are reported and hence the same is processed on infographic. As I have said earlier how much ever good is aircel in the home network, it is that much fraud in international prepaid roaming. In such a case it is waiting for a incoming call to happen. It will deduct amount immediately even if we reject (pressing red button) the received call. This is not the case with airtel, idea and vodafone. I haven’t experienced unfair deduction even when I brought Kuwait operator’s SIM in India and kept idle (roaming in airtel or idea network). You mean to say about International SIM roaming in Aircel network? Because, my relative was using an Omani SIM in Chennai with Aircel network, and everything was just fine.